spillyjane knits: Haunted by socks. 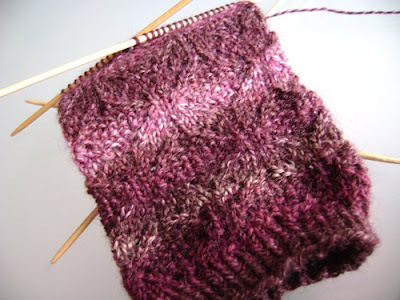 It's been forever since I even thought about her (or socks in general,) but do you recall me talking about Penelo (Ravelry link) a little while back? How about a visual aid to jog your memory: Well, she's done! I surprised myself and finished her off today. The pattern is going to be released sometime this weekend (8 - 9 November 2008.) I would have provided a more recent picture but I lost the light before I had the chance to take one tonight. Expect proper pictures to appear shortly. So there you go -- some sock content at long last. There may be more to come, as well! November 4, 2008 at 9:14 p.m. I'll be looking forward to this one! November 5, 2008 at 9:16 a.m.